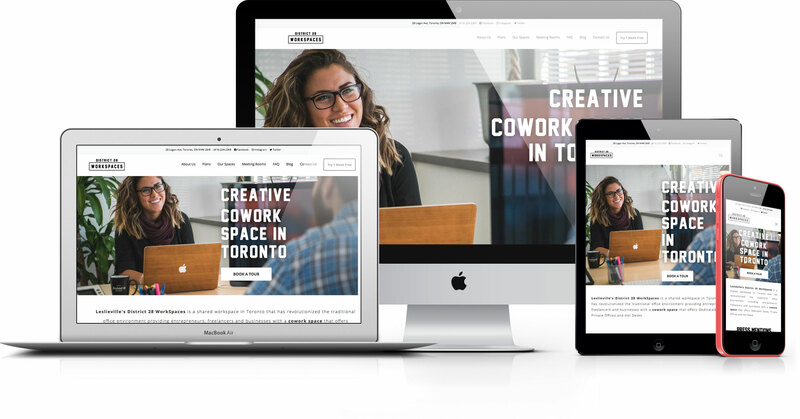 District 28 WorkSpaces is a cowork and private office space in Toronto Ontario. When we started with District 28 WorkSpaces our mission was to solve their problem filling up office space. They have a great facility but had trouble building awareness in the community. When we started with District 28 WorkSpaces our mission was to solve their problem filling up office space. They have a great facility but had trouble building awareness in the community. After the launch of website we carefully monitored Google analytics to find where customers were leaving the website and how customers were converting to further enhance our user experience. Our SEO goals were also met District 28 WorkSpaces went from 5th - 6th page ranking to first page in a number of competitive keywords. Local ranking also sky rocketed so District 28 WorkSpaces now appears on the top of Google maps. The next step was to build a social media presence. Due to Instagram being the fastest growing and most engaging social media it became a priority. We have ensured to post a couple times a week to keep our growing audience engaged. Since taking over their instagram follower based has climbed from around 100 followers to thousands while maintaining above industry standard engagement rates. The next step was advertising, our team of Adwords certified professionals and social media aficionados quickly developed thought provoking and engaging ads to drive customers to the website. We change ads periodically to ensure the advertisement doesn't get stale and we mix in re targeting ads targeted at people who have already visited the website. Since going through the HLM Digital machine they have seen massive growth in customer base. They Reached 100% capacity with a waiting list on the private offices and the cowork space has recently expanded due to increasing demand. Our work also made the website easier to find for press and in the past few months District 28 WorkSpaces have been featured on BlogTO, GoodHood a very popular blog in the specific community of Toronto where District 28 WorkSpaces operaties, and Nomad Capitalist and very popular entrepreneurship blog with millions of impressions.